The Pet Park is made of a synthetic grass like surface. It prevents stains and rinses clean in seconds! The Pet Park’s triple stage protection allows fluid to pass through the antimicrobial mat. The mat stays high above the liquid in the collection tray because of Pet Park’s elevated grid system. Simply empty the collection tray at the end of the day! 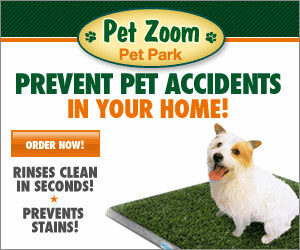 Unlike dripping newspapers or expensive wee wee pads, Pet Park’s reusable surface stays fresh and sanitary. Plus, it prevents the spread of germs and odors from wet paws! Pet Park saves you time and money by preventing damage to upholstery and flooring. Similar items like this sells for $316 but now you can get it for only $29.95! You’ll also get a free Pet Zoom Clipper. Clip your dog’s nails with ease! A free $20 value as a bonus.